At the start of the 19th century, gentleman’s clubs were the only places really to resemble modern restaurants in terms of menu and ambience. Members-only establishments, they were exclusively for the upper classes, and ladies were not permitted to dine with their husbands. Meanwhile, the working classes ate in taverns, saloons, or in coffee houses, where they could take their own food and have it cooked for them. 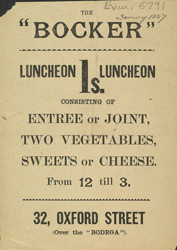 Gradually, cheap restaurant's such as Bocker's opened, where a standard dinner of meat with two vegetables could be purchased for only a few pence.